The organization calculated the death rate to be about 70 percent among hospitalized patients but noted many Ebola cases were only identified after they died. 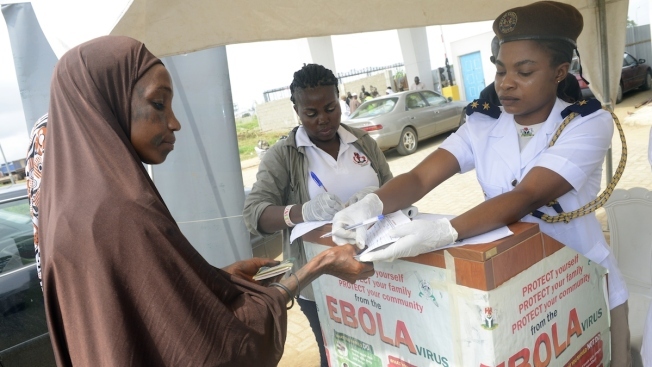 A Muslim faithful on pilgrimage to Mecca undergoes health checks for the ebola virus at the Hajj Camp, Murtala Mohammed International Airport in Lagos, on September 19, 2014. New estimates from the World Health Organization warn the number of Ebola cases could hit 21,000 in six weeks unless efforts to curb the outbreak are ramped up. Last week, the U.S. announced it would build more than a dozen medical centers in Liberia and send 3,000 troops to help. Britain and France have also pledged to build treatment centers in Sierra Leone and Guinea and the World Bank and UNICEF have sent more than $1 million worth of supplies to the region. "We're beginning to see some signs in the response that gives us hope this increase in cases won't happen," said Christopher Dye, WHO's director of strategy and study co-author, who acknowledged the predictions come with a lot of uncertainties. "This is a bit like weather forecasting. We can do it a few days in advance, but looking a few weeks or months ahead is very difficult." They also calculated the death rate to be about 70 percent among hospitalized patients but noted many Ebola cases were only identified after they died. So far, about 2,800 deaths have been attributed to Ebola. Dye said there was no proof Ebola was more infectious or deadly than in previous outbreaks. The new analysis was published online Tuesday by the New England Journal of Medicine — six months after the first infections were reported on March 23.
WHO is just one of the groups that have attempted to calculate the epidemic's future toll. On Tuesday, the U.S. Centers for Disease Control and Prevention is expected to release its own predictions for only Liberia and Sierra Leone — the two West African countries that recently have shown the steadiest and most alarming spread of cases. The CDC calculations are based, in part, on assumptions that cases have been dramatically underreported. Other projections haven't made the same kind of attempt to quantify illnesses that may have been missed in official counts. The agency's numbers seem "somewhat pessimistic" and do not account for infection control efforts already underway, said Dr. Richard Wenzel, a Virginia Commonwealth University scientist who formerly led the International Society for Infectious Diseases. Other outside experts questioned WHO's projections and said Ebola's spread would ultimately be slowed not only by containment measures but by changes in people's behavior. "It's a big assumption that nothing will change in the current outbreak response," said Dr. Armand Sprecher, an infectious diseases specialist at Doctors Without Borders.